The daughters of Dr. Martin Luther King Junior and Governor George Wallace will meet with Governor Robert Bentley today. It’s all part of a ceremony to mark the fiftieth anniversary of the Selma to Montgomery voting rights march. 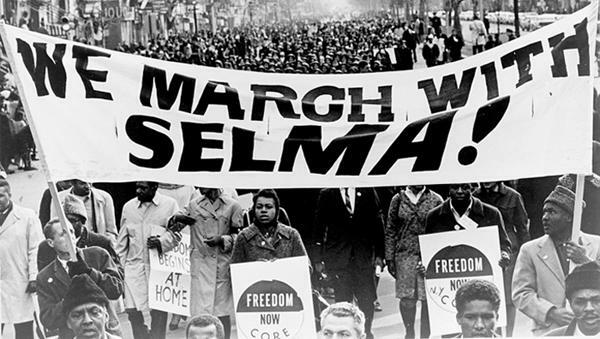 It was on this date in 1965 that Dr. King led the procession to Alabama’s State Capitol. APR spoke with Bernice** King during the remembrance of “bloody Sunday” in Selma. She says voting rights are being challenged in the U.S. and the fight has to go on. King is referring to a U.S. Supreme Court decision to remove election oversight through the Voting Rights Act. Be sure to join APR this Friday for the documentary “More Bridges to Cross.” That’s Friday at seven p.m. on Alabama Public Radio. Shelton State Community College will be opening an exhibit this afternoon commemorating the experience of Alabamians in the Holocaust. Darkness Into Life is a multimedia exhibit that will tell the stories of twenty Alabama Holocaust survivors. Painter Mitzi Levin and photographer Becky Seitel weave together still images, various paintings and text to tell a story of the Holocaust that hits close to home in Alabama. Of the twenty survivors depicted in the exhibit, sixteen are still alive. Levin says none of the survivors ENJOY telling their stories, but they want speak for those who were less fortunate. Levin also says it’s vital that today’s generation learns about the genocide of six million Jews during World War II. Darkness Into Life will be available to view until April 10 at the Cadence Bank Art Gallery at Shelton State Community College. Jefferson County health officials are responding to a case of tuberculosis at Homewood High School. Homewood City Schools Superintendent Bill Cleveland says staff will offered voluntary TB test for students and staff today after a freshman tested positive for the disease. According to the Centers for Disease Control and Prevention, tuberculosis is a bacterial infection that usually targets the lungs, but may also impact other areas of the body. The virus usually spreads through the air when someone carrying it in their lungs or throat coughs, sneezes or spits and someone nearby inhales the bacteria. APR Newscast Wed. March 25, 2015 4:32 p.m.